Sarah doesn’t care whether you origami-fold your knickers or if you find joy in that vase. Marie Kondo she ain’t. And she hates hoarder-shaming TV. But bloody hell can she turn your life around. The way she sees it, if your stuff is out of control, you can’t move forward with life. Anything. An exploding inbox. Bulging attic. Piles of paperwork. Years of unsorted photos. A laptop of disorganised images. Drawers of unopened bank statements. While she’s sorting, she’s talking, counselling, supporting you because she knows there are usually reasons why we let things get out of control, whether it’s relationship issues (she specialises in helping clients through divorce, from legal forms to dividing possessions) or self-esteem or just bad habit. Sarah is a refreshing, Aussie whirlwind, bursting with energy, laughter and a fair bit of realism too. She has a counselling background and is unjudging but very practical and she’ll sort your whole life out in hours. Just take a look at your fruit bowl. What really gets Sarah’s alarm bells ringing is paperwork in it. Actually anything in the fruit bowl. That isn’t fruit. “When I see that in a house I know the person isn’t coping,” she says pointedly. You’ve been warned. Professional declutterer Sarah Macnaught wanders around my home appraising my belongings. She is on a mission to wade through my unwanted clothes, books and toys to find things to sell. Sadly, it was bought recently from John Lewis. And I need my desk. But her point is reassuring: you do not need a home full of antiques and designer clothing to make money. If you are having a clear-out, fast fashion and functional furniture sells well, too. So why is Sarah, of Rightsize, looking at my desk? 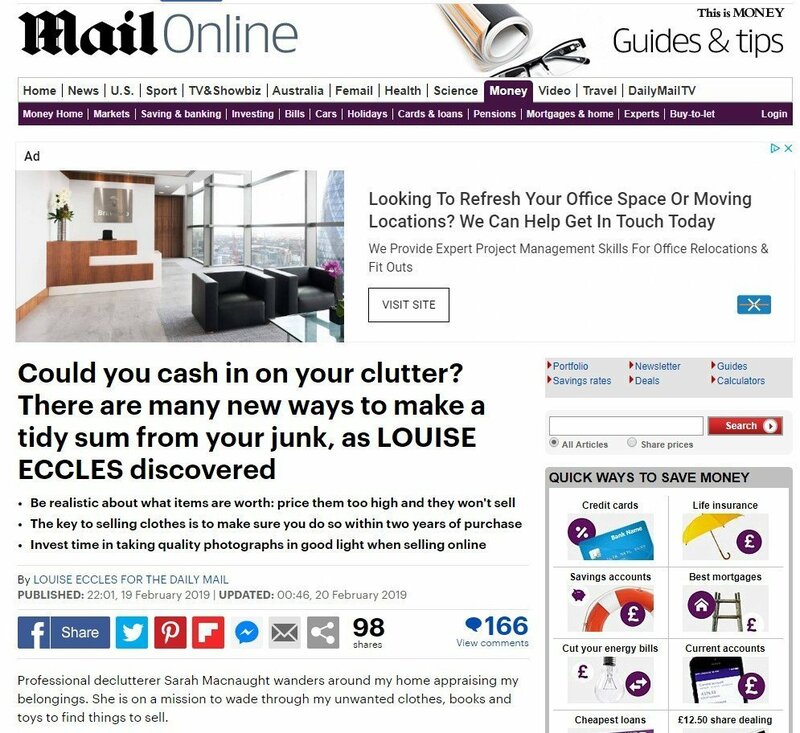 I have joined millions of Brits in the decluttering phenomenon. Home-blocking is a term used to describe the aging population’s seemingly intransigent preference to remain in a property rather than downsizing to release urgently needed homes back to the local community. The major barriers to downsizing from a family home into something smaller are practical, financial and emotional. 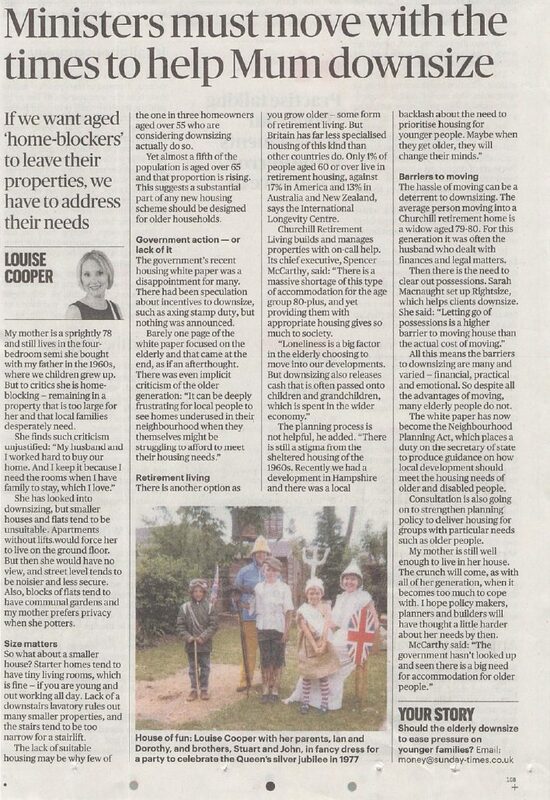 While I advocate for the reduction or abolition of stamp duty for the elderly and urge developers to ensure most new housing development is suitable for the 20% of our population aged 65 and over, I am also keenly aware that emotional barriers of downsizing will challenge any potential homemover until circumstances force them. As a downsizing specialist, I work with elderly people to support their decisions about what to keep and move with, and what to let go. Sometimes we can spend months deciding what to keep and then just take 10 days to sort through every thing else. Or the other way around. Either way, the process is the same while the stories need to be told, legacies created and safe passage of goods ensured. Often I am “rightsizing” my clients to make the best use of the space they have, while they wait for the unwelcome shove from Mother Nature to make that downsizing decision for them. Until this type of support service for our seniors grows sufficiently as it has in the USA where organizations such as The National Association of Senior Move Managers thrive, the critics will just have to live with their unruly home-blockers. With thanks to Louise Cooper’s article in The Sunday Times Money Section. 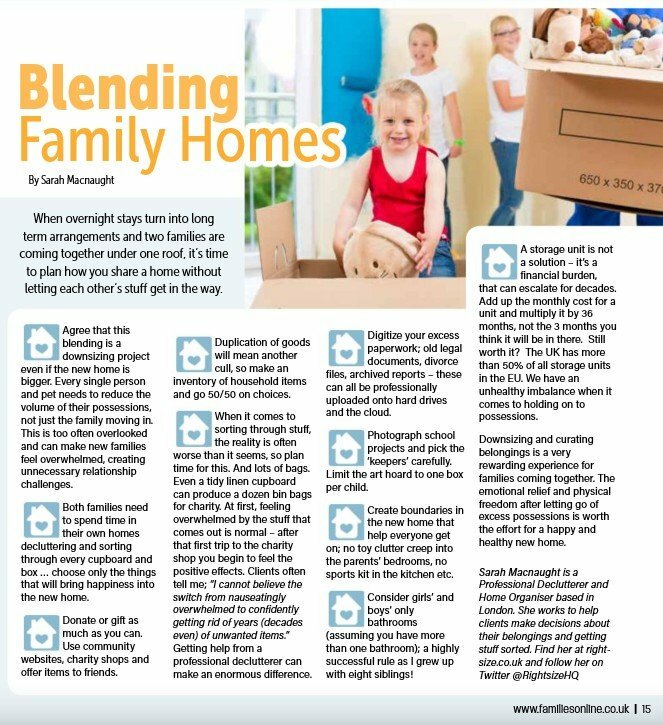 Article discusses all the practical ways to help families divide things, not themselves after a bereavement. In addition to my organising services, I offer my clients use of FairSplitTM online inventory system to really get things sorted fairly, no matter where in the world they are. PDF Download How to Divide Things, Not Families, after bereavement. 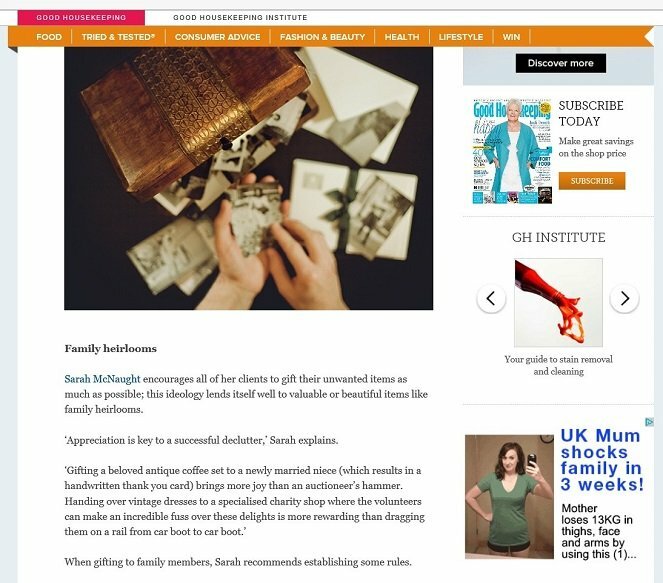 Good Housekeeping featuring Sarah Macnaught .